Japan’s Ministry of Defense (MoD) is planning to extend the range of its homemade ASM-3 long-range air-to-surface cruise missile from around 200 kilometers to 400 kilometers as part of a concerted effort to boost the country’s defense capabilities against Chinese naval forces, according to Japanese media reports. The new missiles are meant to help deter Chinese aggression against Japan’s remote southwestern islets of the Ryukyu Islands chain, stretching southwest from Kyushu to Taiwan, and against the Senkaku/Diaoyu Islands in the East China Sea. 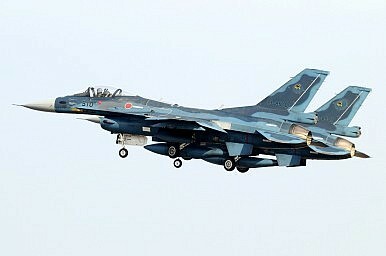 Japanese Defense Minister Takeshi Iwaya said on March 19 that development of the air-launched ASM-3 anti-ship missile has been completed but that the defense industry is still developing a new advanced mission computer (AMC) for integrating the new weapon system with Japan Air Self-Defense Force’s (JASDF) F-2 multirole fighter jets, a Mitsubishi license-produced variant of Lockheed Martin’s F-16. Development of the missile kicked off in 2003. A first missile jettison test — used to validate the aerodynamic separation models of the missile — was conducted in March 2017 and was followed by extensive user trials. In August 2017, Japan’s Acquisition Technology and Logistics Agency (ATLA) released for the first time footage showing a test firing of an ASM-3 missile prototype. As I reportedly previously, the MoD completed development of the ASM-3 in January 2018. “Each [F-2] will be capable of carrying up to two XASM-3 missiles,” I noted July 2017. “The new missile will replace the older domestically produced Type 80 and Type 93 air-to-ship missiles capable of reaching near supersonic speed.” Powered by a ramjet engine, the missile can reportedly reach top speeds of up to Mach 3 and has an operational range of 80 nautical miles (150 kilometers. )” It is unclear when the new extended-range version of the ASM-3 will be operational. Notably, Japan is also developing a new land-based solid-fueled anti-ship missile with an approximate range of 300 kilometers. The new missile is expected to be deployed by 2023 and will will supplement the Type 12 subsonic anti-ship missile, an upgraded variant of the Mitsubishi Heavy Industries’ Type 88 surface-to-ship missile with a reported range of 200 kilometers (124 miles), currently in service with the Japan Ground Self-Defense Force (GSDF). Japan’s first supersonic air-launched anti-ship missile is slated to enter service in 2019.